The world's oldest and largest koala sanctuary, the Lone Pine Koala Sanctuary is home to more than just the cute and cuddly koala, but also to kangaroos, Tasmanian devils, wombats, echidnas and various species of reptiles as well as Australian parrots, cockatoos, kookaburras and cassowaries. Lucky visitors are actually able to handle the koalas here (for a fee) making this one of only a few sanctuaries in the world where this is possible - a dream come true for many. Feeding and petting is also permitted and is carefully monitored, making this an ideal activity for families travelling with small children. 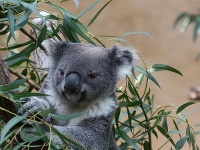 The Lone Pine Koala Sanctuary is arguably the best place to get up close and personal with Australia's unique animals, and a delight for the whole family.